There plenty of fluorescent low-power lights out there, but their light depresses me. Unlike the EnduraLED, a LED-based bulb that produces the same light of a 60W incandescent light bulb but only takes 12 watts. The savings could be amazing. 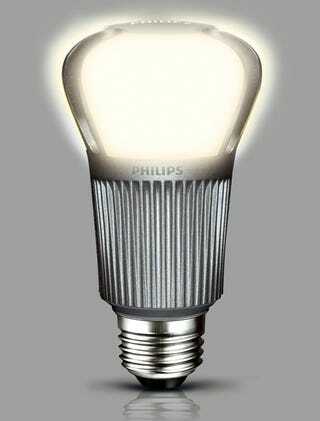 According to Philips, 50% of all the 60-watt incandescent light bulbs are bought in the United States. That's 425 million units. If you replaced all those lights with this new EnduraLED, they claim that the US will save 32.6 terawatt-hours a year. How much is that? Enough to power 16.7 million US homes for a year. Or in other words, 14.4% of the total number of households. Philips says that this could cost 5.3 metric tons of carbon emissions per year. If you don't give a damn about the environment, that's $120 per light bulb per year. Not too shabby.